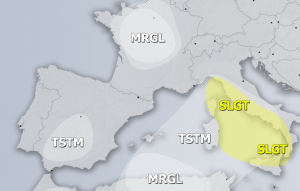 Two days ago, when a strong upper trough transformed into the upper low over southern Mediterranean, numerous severe storms were on going over Greece and Aegean sea as it was already noted in the morning update on Nov 6th. Apparently, one of the well organized supercells spawned a large wedge tornado in Aegean sea. On its front side, an additional satellite waterspout type tornado occured. More details about this impressive event are still collecting and will be added later when they become available. The event occured within the MDT risk of DAY 1 Outlook for 06/11/2013 when severe storms capable of producing tornadoes were expected. Such a tornado is truly a remarkable event for Europe, especially when there is a satellite tornado around the main larger one. Its a sign that this supercell was very severe storm. This event reminds of a similar event of a strong tornado with a satellite waterspout which occured on the 17/09/2013 over Trieste gulf, Italy.